Sandra Kozlowski is the author of Building Blocks of Recovery , singing bowl artist, Chemical Dependency counselor, Body Positive Yoga instructor. I feel and that's OK! I am back and other intentional living! Grounding, Non grasping and mountain! Spending more time in learning how to achieve balance in the I AM level of intention: non grasping, mountain pose and the meaning of grounding. 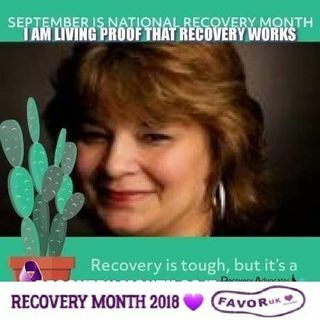 I am back to share joy in recovery! I am an author, singing bowl musician, speaker, chemical dependency professional, yoga teacher and woman in recovery. In my years of learning to get better myself as well as to help others, I have gained knowledge and experience from my own story as well as others in recovery. While I completely believe in the strength and life ... See More changing experiences of 12 step recovery, there is more. With the Building Blocks of Recovery system , I will help you to find areas of your life that you want to create change in and help you to find your strength Whether it's your house, sleep schedule, job or perspective, Building Blocks of Recovery is a system that can help you to learn how to make a decision for healing intentionally . Join me Sundays at 7:30 PM PST for the Building Blocks of Recovery show. Learning a few tips and tools about how to begin to learn to like yourself, the basis of a new start!! Learning that you have feelings, how to share your feelings and being OK either way is a daunting task....but you can do it!! !